It is hard enough to have to flee your home country because of war and persecution without also having to suffer through the immense pain that can be caused from being separated from loved ones and family. Ahmad* was desperate when he first got in contact with Mobile Info Team. He is a young Syrian alone in Greece. The only family member he has in Europe is an older brother in Germany with whom he would like to live. When he approached us for help, Ahmad didn’t know anything about the status of his ongoing reunification attempt to his brother. In order to resolve this, a MIT caseworker asked the Greek authorities for an update on the case and which stage it became evident that the German authorities were unwilling to accept his family reunification request, despite multiple attempts by Greece to see it succeed. As several things about the reasoning of the rejection seemed odd, MIT Coordinator Michael requested the full reunification file from the German authorities so that he could fully understand their decision. Through this, it became clear that there had been a procedural error. After handing in additional documents, the German Dublin Unit agreed in a phone call to re-examine the case. In January the reunification request of Ahmad was approved. He will be able to travel to his brother soon and will hopefully find some peace and rest now, finally being reunited after a long and troublesome journey. *All names have been changed to protect the identity of the people involved. For someone who is not Greek, snow in the winter is not so rare and images of a snow dusted Thessaloniki sea promenade are something of beauty. But for the homeless asylum seekers living on the streets here, the snow was a dangerous occurrence. 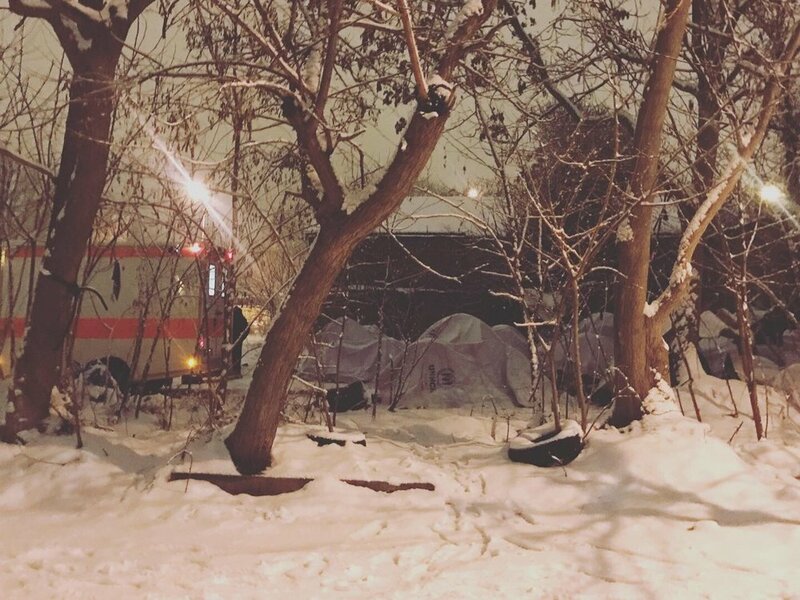 Having already been evicted by the police from a construction site area in December, a group of homeless asylum seekers had only a freezing cold car park and summer tents to protect them from the elements. When the temperature dropped to -10 degrees in January, the situation became life-threatening. In Thessaloniki, there were no reported deaths because of the cold but there were many cases of frostbite and hypothermia. As next winter approaches, there is yet to be a real solution for housing the homeless population. Transit sites were closed this year in winter for winterization and will be reopened at the end of February when the cold temperatures have gone. Also, the idea of a short term shelter for homeless asylum seekers was recently discarded, for reasons that we find hard to accept as valid. This is leaving us with few remaining options other than standing together with some other organisations in solidarity with the affected people and try to offer some support. As of January 2019, MIT has two new caseworkers, Paul from France and Abbas from the UK. Both are talented volunteers with law degrees and experience in the field of asylum law and it is great to have them on board! Despite their experience, getting to grips with the Greek asylum procedure and how we navigate it is complex. When starting, it is very important that new caseworkers receive extensive training on family reunification issues, the asylum process, travel documents, appeals and Greek social security numbers. It is essential that our caseworkers provide accurate information wherever and however they asked for it. To get to that point it requires many training and shadowing sessions until somebody can work as an independent MIT caseworker. January was dedicated to training Paul and Abbas, who made very quick progress and have achieved independence. They are already the backbone of MIT’s operation!